Are you noticing early signs of facial aging, wrinkles or double chin? As the years roll by, we experience soft tissue loss around the mouth, cheeks, and chin. 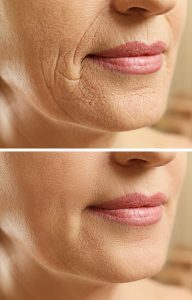 Even moderate wrinkling of the skin on the forehead, eyes and lips. Our Laser Facelift will “lift” the upper face rather than “pulling” the skin as in the traditional surgical facelift, to give your skin the tightening and toning to your face and neck areas to achieve beautifying results. $350 SALE $99 each session.